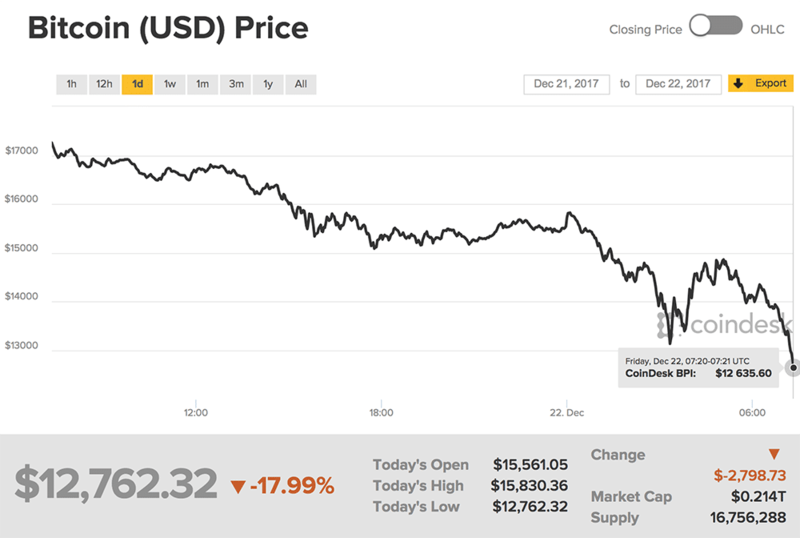 A mini heart attack scenario for the investors of Bitcoin cryptocurrency as Bitcoin fell more than 18% to below $13,000 on the Bitstamp exchange on Friday, extending overnight losses. The “wild” cryptocurrency, which was at about $1,000 at the year’s start, had ascended to a record high of $19,666 (~Rs. 2,163,260) on Sunday in lead up to exchange giant CME Group’s launch of Bitcoin futures before losing worth rapidly. Bitcoin has seen some of most extreme swings in December. Previously, in November, it collapsed almost 30% in four days from $7,888 to $5,555. In September, it fell 41% from $4,979 to $2,972. On Thursday, Bloomberg reported that Goldman Sachs Group Inc. is setting up a trading desk to make markets in digital currencies like bitcoin, citing people familiar with the matter. According to the report, the Wall Street bank aims to get the business running by the end of June. But others may be testing their “luck” in alternative cryptocurrencies, as bitcoin is far from alone in having seen its price recently hit an all-time high. All of the top-20 coins by market capitalization have seen an all-time high within the past four days. Of those, cryptocurrencies like bitcoin cash, dash and Litecoin have since posted declines in the last 24 hours. Lol True Said This was just a ponzi scheme. If you actually believe that, then you’ve got a lot of reading up to do. Cryptocurrency and bitcoin is revolutionary. Read the white paper. Yeah that’s why it dropped to 13K$ i m just saying bitcoin itself is ponzi scheme but the blockchain technology itself have many advantages and it is no doubt revolutionary. How is it a ponzi scheme? Bro Google is your friend. i can’t argue with you. you are not getting my point. it is ponzi and pyramid both and it is forbidden in Islam. I’m not getting your point because you haven’t made a point yet. Prove that it is a ponzi scheme. its getting up again , i believe its here to stay. Pakistan like always will always far late to accept something in economy, declared it as illegal.